Indian Colours at The Bombay Store! The Bombay Store has always been the choice for users looking for lifestyle products that reflect a blend of traditional and contemporary techniques. One such brand who loves art as much as we do is “Indian Colours”. 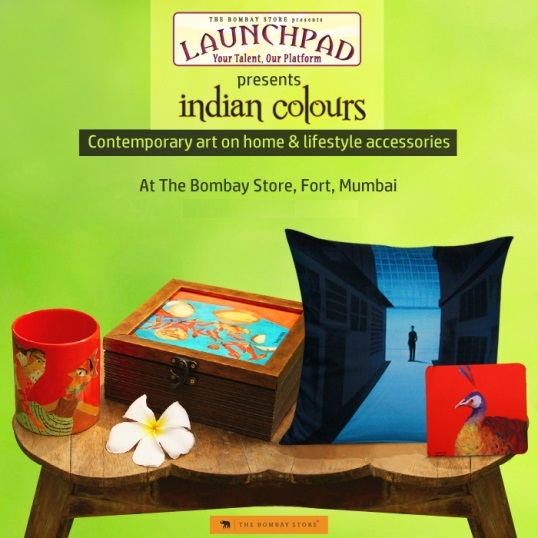 “Indian Colours” – A home decor and lifestyle accessories brand is exhibiting its products at The Bombay Store under our Launchpad initiative – A platform for young designers & brands to showcase their new products and ventures. Indian Colours was launched last year with the aim of making the best Indian contemporary art a part of your life in many different ways. Indian Colours licenses images from some of the country’s finest modern artists, and adapt them on cushion covers, coffee mugs, coasters, iPad sleeves, phone covers, bags and more. The artists get royalties – and customers get fine art at an affordable price! The artists whose works are being highlighted include Samir Mondal, Babu Xavier, Nikhileswar Baruah, Rajendra Kapse, Haren Vakil, Shubha Gokhale, Soumen Das, Shruti Nelson, Aashna Jhaveri and Pradeep Mishra. Each of these artists have been practicing art and exhibiting on prestigious platforms for several years. If you love art, you no longer need to view it from a distance. Come and join ‘Indian Colours’ at The Bombay Store! With the breezy nights and the pleasant cold mornings, ‘Winter’ – The season of blossoms has arrived. It is that time of the year when everything around is vibrant and colorful. Keeping this in mind ‘The Bombay Store’ has launched a new designer collection ‘‘Rangrezz’’. “Rangrezz” as the name suggests, is a colourful collection full of vibrancy and beauty. We have launched this collection across a variety of product range which includes Cushion Covers, Sling Bags, Hand Bags, Jhola Bags, Mugs and Shot glasses. The designs are very enchanting and reflect creativity, art, heritage and ethnicity. Flaunt these bags with vibrant designs and they will definitely grab a lot of eyeballs for your trendy selection. The Cushion covers won’t fail to add on to the brightness of your home and give it an elegant touch. And the collection of mugs and shot glasses will add a speck of colour to your party time. This new collection is available at ‘The Bombay Store’ outlets at Mumbai – PM Road, High Street Phoenix, Inorbit Malad, Inorbit Vashi; Pune – MG Road, Market City Mall and 1 MG Mall – Bangalore. So what are you waiting for? The collection is up for grabs online too.